At least a guy can dream huh? I and every OutKast/Andre 3000 fan has been waiting for a new album from both OutKast and Andre 3000 (solo) for almost 6 years now. The has been a very draining experience for the Kast faithful. For about 4 of those 6 years we were dragged along in the belief that Big Boi would release a solo album just about every month until it was FINALLY released back in July 2010 and boy was it worth the wait!!! Big Boi’s album “Sir Lucious Left Foot: The Son of Chico Dusty” was in my opinion the best, most sonically charged and different album of that year along with Janelle Monae’s “The ArchAndroid”. Both albums were highly praised by critics and fans alike, yet got snubbed at all award shows for the big awards. They were among the top 3 highest rated albums of the year on Metacritic, a website that aggregates a score based off of all reviews that have been submitted on the alum from all major sources. Anyway, I digress. In 2010 we finally got Big Boi’s album, but now we are still waiting on Andre 3000’s solo album……and OutKast’s album, but if Dre can drop his solo album, I can wait a little longer on an OutKast joint. Over the past 6 years, Andre hasn’t been totally in hiding. He has been featured on 21 tracks to date, teasing us 1 song at a time. It seems to me he’s using these commercials and the increase of featurings to get himself back into the spotlight after so many years of laying low. Also Gorillaz, James Murphy and Andre himself have a song called “DaYaThing”, as part of a Converse “Three Artists. One Song.” campaign, being released on February 23rd!!! I REALLY think he’s coming back and SOON. I CAN’T WAIT ANYMORE!!! 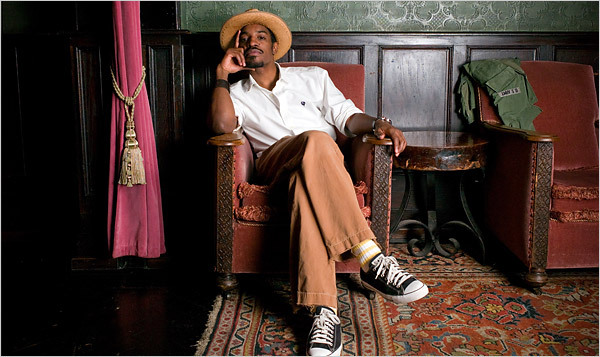 I have sat around SO many nights……and days imagining what his new album might be like, knowing that whatever I could think up would never touch the awesomeness that Andre 3000 has been cooking up and it seems that I will soon be able to feast my ears on the Dre Buffet!!! I just NEED some real music from one of my only living idols. Come on 3 Stax and hit us with what you got!!! This entry was posted in Music, News, Video and tagged 3 Stax, 30 Something (Remix), 3000, All Together Now, Andre 3000, B.o.B, Bei Maejor, Beyonce, Big Boi, Chris Brown, Ciara, Converse, Da Art Of Storytellin' (Part 4)', Dedication To My Ex, Devin The Dude, DJ Unk, DoYaThing, Drake, Dre, Dueces (Remix), Everybody, Fabolous, Fonzworth Bentley, Gillette, Gorillaz, Green Light, I Do, I Want You (Remix), Ice Cube, Interlude, International Player's Anthem (I Choose You), James Murphy, Janelle Monae, Jay-Z, Jim Jones, John Legend, Kanye West, Kast, Ke$ha, Lil Wayne, Lloyd, Lookin' For Ya, Marsha Ambrosius, Metacritic, Murphy Lee, Music, NaS, Nelly, OutKast, Party, Play The Guitar, Raekwon, Rich Boy, Ride (Remix), Royal Flush, Sa-Ra, Sir Lucious Left Foot: The Son of Chico Dusty, Sleazy (Remix), Sleepy Brown, Snoop Dogg, T.I., Tech N9ne, The ArchAndroid, The Beatles, The Game, The Real Her, Throw Some D's (Remix), UGK, Video, Walk It Out (Remix), What A Job, Young Jeezy. Bookmark the permalink.